Two weeks today it’s ON, and I have never been so ready for a big ride before. 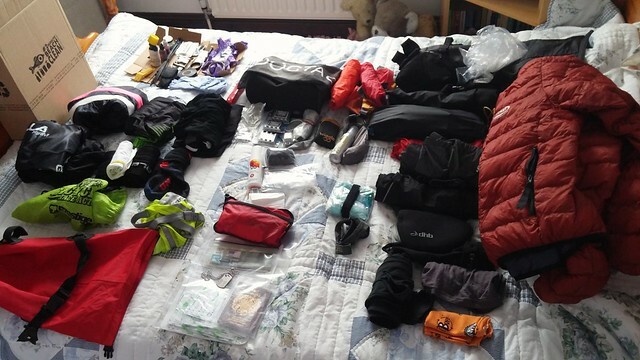 The bike is prepared and on ice, and the kit is laid out in the spare room ready. But can anyone really be ready for the unknown. People ask me about the weather and the wind directions, crossing a continent means the answer is expect everything, it’s still snowing in Colorado right now. It takes a while to reach the red bits. Last year it was 100 degreesF on day 1 on the West coast, this year it will be cooler and raining apparently. The first big climb after 300 miles at 5000ft, Mackenzie pass, is still yet to be dug out from under 10 metres of snow! That’s day 2. Basically they have had a really long and late winter over there in Oregon. Those blue bits are Colorado and the Rockies at 11,000ft and many nights will be spent at over 6000ft, and that’s before we consider the every which way winds. After a great test ride in Scotland Alba900, the climbs and the extremely cold nights have focused my mind. You could say it’s a drop down in gear, whilst also an increase in gear; the triple is back on, warmer riding kit is packed. At times it’s almost a dirty word to mention low gears on the inter-web, the MTFU get on their soap boxes as if their manliness is in question. We are all different but in the end my knees and back have already relaxed knowing they can enjoy this trip too. The added benefit is I can also ditch the 10 speed, it’s just so particular to set up. Hopefully it will not require touching for the 4300 miles; 9 speed is just so much more robust. 46-11 can see me cruising at 28mph, fat chance of that happening for too long; and when it does I will be on the drops downhill. The return of the comfort blanket. An added bonus in that this Q factor just seems to be much more natural. 20 years of conditioning perhaps. For the long hot days when the distance between supplies is stretched, or for long nights the set up allows for 4 x 750 ml bottles. Previously strapping a 1.5 L bottle on the seat pack has worked but is untidy. The lower bottle is strapped on and will be a store only, in fact a bottle with no drink spout would be ideal. The fourth and easy quick grab riding drink bottle being held in an Apidura feed bag on the aero-bars. In another new move the Aero-bars are now mounted on a Fred T bar from the steerer tube. You can just see a white circle above the stem, that’s a waterproof switch for the lights mounted in the end of it. 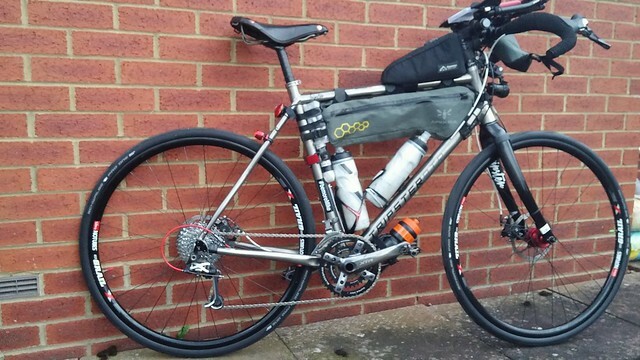 This clever gizmo favoured my Tour Divide riders mounts the bars further back and higher. The higher than normal aero position reduces strain on the back and the front sit bones, and as I consider them a front rack and ocassional hand position change, that’s perfect. An added bonus is very quick removal for flight packing. The Scotland trip again reminded me how useful it is to have route info quick to hand, planning the next stops and seeing just what’s ahead. 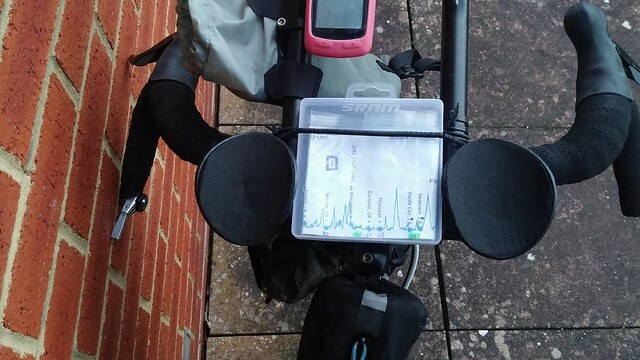 After trying several ways of fixing maps and notes in plastic bags over the years it was a eureka moment when I realised that a SRAM chain case fits snuggly on the aero bars. Secured with an o-ring band, easy to open and waterproof, we like a lot. Crikey look at all that kit. Going back to that weather overview this kit lends to more warmer gear and a little more backup to cover up to a month away. Compared to the TransCon’ and Transatlantic events the only additions really are a warm riding top which doubles as a cold sleeping layer and doubling up on leg/knee warmers for all night cold riding and sleeping as my new Klymit inflatable mat is half length. Spare shorts as normal, a clean backside is a happy one. The usual bivy bag and silk liner with the PHD pullover as a sleeping bag and get out of jail stationary warm jacket. 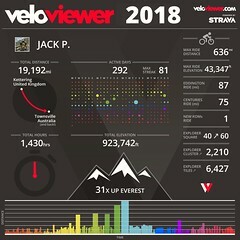 A months worth of arse cream and suncream all adds to the high weight. How much? I don’t care, I’m not a race contender. Everyone keeps asking about the plan after the success at the Transatlantic. 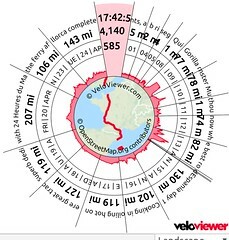 This is a huge scary ride, and I’m under no illusion that 200 mile rides at altitude are not possible. Being honest it’s all about finishing hence the choices detailed above, and the race really doesn’t start until the third week after Kansas is disposed of. If you are following the tracker (to be announced but odds on its at trackleaders.com/transam17 ) don’t expect fireworks. 170 miles a day gets me coast to coast in 25 days, and a Wednesday night pub ride with Bill in Williamsburg. 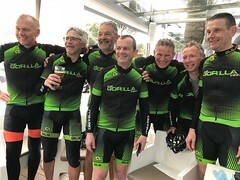 Bill is an ex Gorilla pub rider and it’s a major goal to hook up live on line with the Gorilla pub ride gang back home over a celebration pint. The spot for top Brit is very open though, look out for me and John Souter ripping each others legs off, but not until week 3 hey. Looking for a fast rider, well Rob English looks prepared and fast but there are way more factors than that. Oh hang on he is genuinely an Englishman, scratch that, race head disengaged once more. Good luck Jack. Will be following your spot with interest. Good luck and ride safe! Will be watching this one keenly. I looked at Rob English’s bike and yes very nice and exquisite craftsmanship but I think I’d rather be riding your set up to be honest. I’d be amazed if he could sustain that position for such a long race. Jack I had breakfast with you in Hamilton Montana. You gave me a card and my wife and I are checking it out. Seems you have gotten yourself into quite a race! I understand more now after reading your blog! I’ll just say hang in there, you can do it.